Get the right towel for the job, no matter what it is. 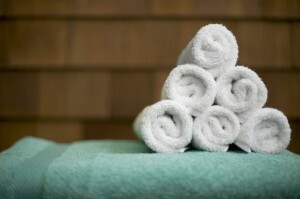 Towels are a necessary tool for many different industries, but the same towel won’t do for every workplace. Making sure you’re renting the right towel for your business’s needs will make any clean up job easier and faster. Whether you need microfiber towels, dishtowels, or shop towels you can count on Lord Baltimore Uniform Rental to supply you with what you need. Microfiber towels and cloths are made by weaving together polyester and nylon blend fibers as small as 1/100th the diameter of a human hair. These towels are perfect for capturing dust and dirt, and should definitely be a part of your dust control system. Microfiber mop heads are also awesome dust control tools and are more efficient at trapping dirt than standard mop head. You go through a lot of towels working in a kitchen or a bar where spills are commonplace. Keeping your workspace clean is of the utmost importance. Dishtowels are perfect for wiping down prep stations and bar tops, containing and cleaning spills, or drying off plates and glassware. Without fluids like oil, grease, antifreeze, coolant, and even wiper fluid, your car wouldn’t be able to operate. Replacing and refilling those fluids is an important part of a mechanic’s job, and dealing with fluids all day will inevitably lead to some spills. Shop towels also help your mechanics keep your customers’ vehicles clean, which leads to happier customers. This entry was posted on Friday, February 24th, 2017	at 12:32 pm	. You can follow any responses to this entry through the RSS 2.0	feed. Both comments and pings are currently closed.